A town in the province of Teruel, Aragon, Spain; situated sixty-three miles southeast of Saragossa. As early as the thirteenth century Jews were resident there. The grand master of the Order of Calatrava, to whom, in 1306, the king of Aragon had presented the town, received under his care, with the king's permission, thirty Jewish families, presumably refugees from France (Jacobs, "Sources," No. 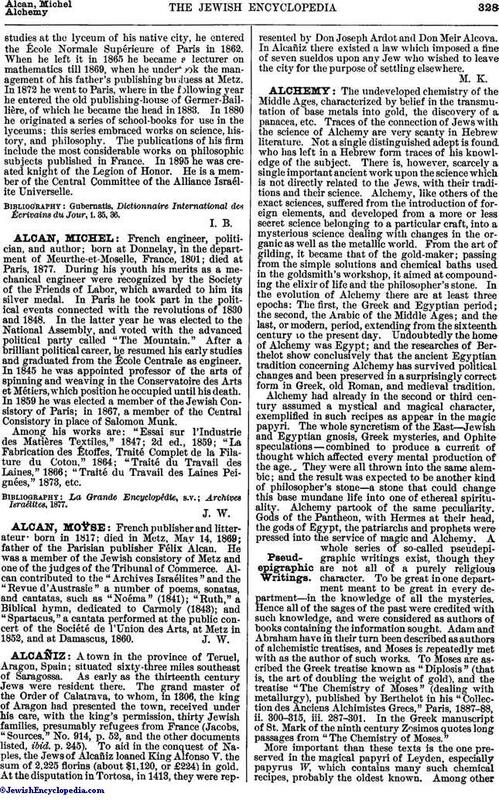 914, p. 52, and the other documents listed, ibid. p. 245). To aid in the conquest of Naples, the Jews of Alcañiz loaned King Alfonso V. the sum of 2,225 florins (about $1,120, or £224) in gold. At the disputation in Tortosa, in 1413, they were represented by Don Joseph Ardot and Don Meir Alcoya. In Alcañiz there existed a law which imposed a fine of seven sueldos upon any Jew who wished to leave the city for the purpose of settling elsewhere.